Well?........ I think I've built a better alpaca trap (or alpaca chute; alpaca sling; llama chute),........and I think many of you will agree! We have now sold PacaTrappers to breeders from 3 different continents!........... READ Testimonials. I wanna cut through the mumbo jumbo promotional verbage and watch the action videos! ......interestingly , The AlpacaRosa has some history of building better mouse traps, like the world renowned Tooth-a-Matic!, .... and more recently, The Fleece-O-Matic, the Fight-O-Matic & Bungee BiteBloc & Smooth-O-Matic & the Magnifico Protecto Guard, The Fleece-O-Matic, The Bean Machine! Check out these time saving products while you're on our website. OMG, How SWEET is this design feature? I told ya, ........I had fun with this project! Before going further, I wanted to address a VERY important feature of the PacaTrapper that some of you handymen should understand and take into account before you plan to build your own PacaTrapper to TRY to save money. The PacaTrapper was designed to "flex" at the arms to provide a cushiony or soft ride in the belly strap. Using wood will not work safely. Too abrupt or harsh jolt to abdomen could do internal damage to an alpaca. I carefully designed a "spring action" for dual purpose of cushioning the belly strap ride AND to help lift the alpaca on to its tippy toes upon tightening the belly straps. I have recieved calls from a couple do it yourselfers and they didnt find theirs to work to good. I dont recommend building a home built pacatrapper, DANGER! The PacaTrapper uses the inherent strength of a buried barn post, which economizes the amount of steel required to fabricate this chute. 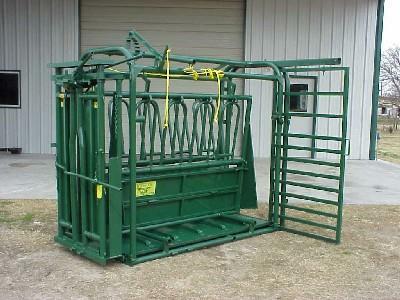 This brings down the cost of the chute & shipping, allows cria to nurse under MOM, and my favorite part.... IT TAKES UP NO BARN FLOOR SPACE! When you study the typical alpaca chute design, they use this big bulky & HEAVY frame, which it's sole purpose is to support the belly straps and a V-brace, but unfortunately from the perspective of an alpaca, many behave as though its a torture chamber to stay the hell out of!. As many of you already know, alpacas need to be pushed into chutes, pens, trailers, vans, etc...... Suffice to say, I found a better, more economical method of placing the support frame ABOVE the alpaca (and their eyes), and removing the STRESS that explains their behavioral tendencies while in a typical alpaca chute......NO LONGER WILL YOU HAVE TO PUSH AN ALPACA INTO A CHUTE!!! !....................and by the way, did I mention the PacaTrapper is totally out of the way of all foot traffic, yet can be used at a moments notice? I had dinner with some very experienced chute owning alpaca breeders the other night and they asked me " Don, how do you keep the alpaca from thrashing around in your PacaTrapper?" I thought WOW!, That question speaks volumes for the effectiveness of the typical alpaca chute. Wouldn't you agree? ........"thrashing?"..... C'mon! I told them through the eyes of alpaca, the alpaca sees nothing more than a Hitching post while using a PacaTrapper. 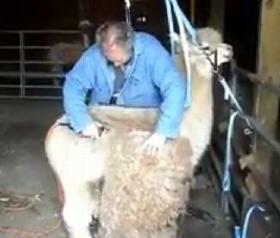 You see folks, while a halter-trained alpaca is "pacatrapped", he sees nothing threatening to get stressed about. Make sense? All straps are above and behind their head or below their chin and since they can only see a post straight ahead, AND since you didn't have to push and muscle them into the chute, they just don't see a reason to get upset.
" My conclusion after watching the calm behavior of Pacatrapped alpacas, is that, the average alpaca doesn't get terrified of something it can't see and doesn't know exists. 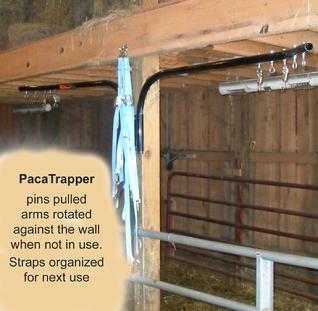 For those unusually frightful alpacas, the alpaca LEARNS with each successive use of the PacaTrapper, there is no need to get upset"
That's not to say that you will never get an alpaca that will not like being in the PacaTrapper, but to say that OVERALL, their attitudes are much improved over other chute or sling type systems. We have panic snaps provided for quick releasing of alpacas that are upset, just as a safety precaution. SIMPLE 1-Man toenail clipping?....Yep!...Now, imagine that she won't let her new born nurse, This is the ticket folks! Look how easy the cria can get under Mom. Tooth a Matic and Fight O Matic. .........."Since there is no steel frame around the alpaca body, crias can easily nurse from a psycho dam, AND you wont get your hand smashed or elbow hyperextended if your arm were to get in between the frame and alpaca, as can be a risk with other chutes, especially when trimming toe nails." NOTE: the PacaTrapper takes up NO floor space! - Take alpaca temps by yourself! -Give IM injections by yourself! -Shear an alpaca by yourself! -Ultrasound a female by yourself! -Trim alpaca teeth by yourself! -Trim Top Knots by yourself! -allows 1-man operation of Tooth a Matic and Fight O Matic, AWESOME! -Stress-free pacatrapping, you gotta love it! Looks substantial, but Wow, that takes a lot of space! I dont have room for THAT in MY barn! How about you? ................. Okay, time for a little movie. 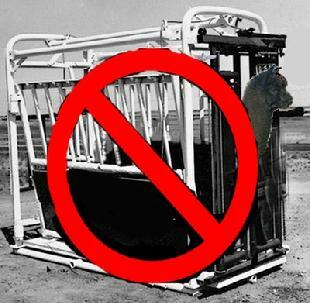 I have been in the alpaca business over 18 years and personally never purchased a chute for one reason. They were too BIG and in my way! I often regretted not having the benefits of owning some kind of an alpaca restraining chute during teeth trimming ,ultrasounding or toe nail trimming. The PacaTrapper would have been so sweet, especially during the few painful occasions when our maidens would not allow their new cria to nurse. 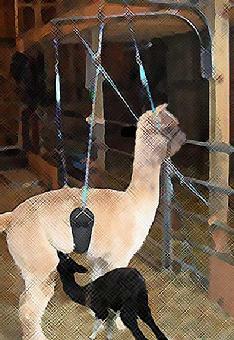 Like many products used on alpacas, the "Alpaca chute" was a carry over device from other livestock industries to help restrain large animals . ......................................"Sometimes we need to take a step back and re-examine why we are still using the same old methods that we were taught. That is exactly what I did. 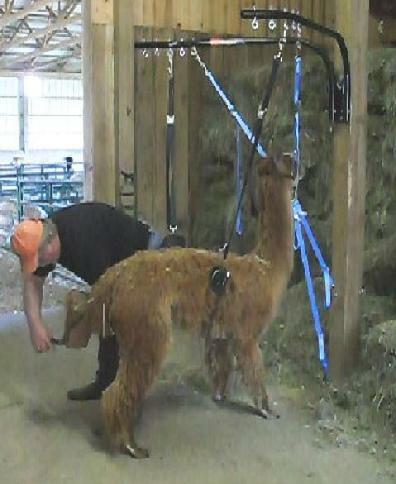 The results can lead to innovative safer and efficient equipment "
As most of us know, Alpacas are a totally different kind of livestock. -They don't weigh 1500 lbs each. -They hate to enter a NO ESCAPE route into an enclosed area . -They do, however, instinctively trust human aid ( they will allow us to restrain). -Sometimes new Moms wont allow their newborn to nurse! -Their padded kicks are not major safety concerns. Add all of these factors into an alpaca restraint equation and viola! We have performed 1-person operation of Tooth a matic and Fight O Matic, with the help of the Paca Trapper. We have also performed ultrasounds with aid of only one Hands-OFF person observing vet during procedure ( this is what prompted us to also include a belly strap with the PacaTrapper). 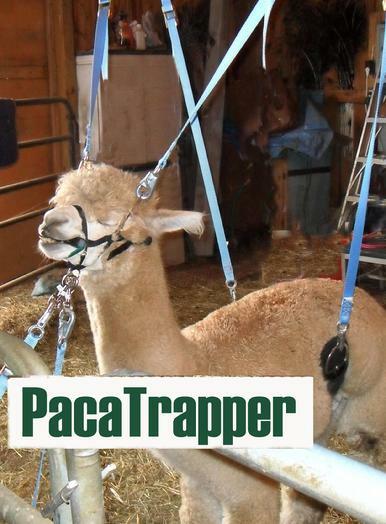 The risk of the breeder and/or alpaca getting injured during ultrasound, toenail trimming, and teeth trimming have significantly dropped since the implementation of the Paca Trapper. The PacaTrapper is designed with quick release snaps for safety. It is also designed with a belly strap to use on the alpacas that like to cush during some procedures. We usually don need the belly strap when doing teeth. Send me an email to TheAlpacaRosa@aol.com and let me know of your interest. We have over 350 units installed around the world as of March 2013. We've had a lot of interest in these PacaTrappers but I think I can keep up with your demand. I will always try to keep plenty on hand.